China’s first environmental protection court was established in 2007 in the city of Qingzhen in Guizhou province. Today there are around 130 such environmental protection courts, tribunals, collegiate panels or circuit courts in 16 different provinces. Luo Guangqian, head of the environmental court in Qingzhen, talks to Gui Tiantian about his work. Gui Tiantian (Gui): How did your ecological court come to be founded? Luo Guangqian (Luo): On November 20, 2007, both the Guiyang Intermediate People’s Court and the Qingzhen People’s Court formed environmental protection tribunals. 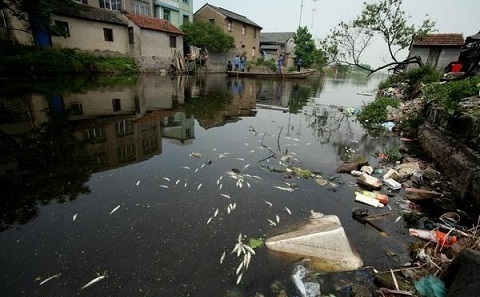 At that time Guiyang’s sources of drinking water were suffering from pollution, and the municipal Party committee proposed using a combination of administrative, economic and judicial methods to protect the city’s drinking water. And that’s how our court came into being. Those water sources fall within Qingzhen’s boundaries, so that’s where the court was set up (Qingzhen is a county-level municipality under Guiyang’s administration). Gui: How many cases do you handle a month? And what types of cases do you see? Luo: On average we get about 10 cases a month. This year, adding up all the different types, we’ve had more than 50 so far. About 30% to 40% of those are criminal cases, mostly to do with protection of resources – for example illegal logging, land use and mining. Civil cases come in two varieties: citizens bringing cases against polluting companies as their personal interests have suffered; and cases brought in the public interest. There are administrative review cases, for example when a company appeals against a fine imposed by the government. We also issue enforcement orders, for example when a company fails to pay a fine. Then the government requests that we issue an enforcement order. That’s quite common. Gui: What about public interest cases? Luo: All the public interest cases we’ve heard have been successful, either via mediation or a judgement. They usually deal with pollution problems, so if the company involved installs water-treatment equipment the problem is solved and there’s no need for the case. That’s a good result for everyone. In other cases, the company spends money on equipment so that it meets environmental standards, and then it can be allowed to continue. So we’re not just out to shut down the polluters. Gui: You tell a story about a group of judges heading out at dawn to collect evidence of pollution. What happened? Luo: An environmental group had received a complaint and handed in evidence. But we were worried the defendant would refute the evidence, so we had to make sure it was strong. We got up at about 3 a.m. and went to the factory in question, but it was too dark to film. So we waited until it got light, at about 5 a.m., and then filmed evidence of pollution. Some of us were filming, others took water samples. Gui: How is the staff of the court made up? How do you compensate when judges lack specialised environmental protection knowledge. Luo: We’ve got five judges, including a presiding judge and deputy. We take regular training very seriously. Some days ago we held a training session, with 80 judges and prosecutors from around the country. These sessions usually take the form of talks by guest lecturers. For example on this occasion we had an Italian professor talking about his research in the European Union and how judges overseas make environmental decisions. Training also covers environmental investigations, assessment of damages and so on. Gui: We’ve also noticed that some environmental courts suffer from a lack of cases. How did your court solve that? Luo: I think there could be several reasons for that. First, it happens if courts only accept local cases. Our jurisdiction covers quite a wide area, we hear all the environmental protection cases for Guiyang’s 10 districts. And since April this year, the Guizhou court has also been designated as the court for cases arising in two other administrative areas. So we have more cases. The second factor is the environmental court’s own rules on the types of cases it handles. If it only accepts cases of infringement of rights and damages due to pollution, it won’t have so many. We currently hear cases involving the protection of the environment and resources, so that gives us a wider range of cases. Third, I don’t think you can assess courts just on the number of cases they hear. For example we might get involved in a case and try and mediate, encouraging the two parties to reach an agreement or make some changes, and then the case doesn’t need to be heard. We do a lot more than just hear cases in court. The fourth reason is to do with how the court works. After a case of pollution there’s a real need for prompt information, so we work with government bodies and the public, and this is also an important source of cases for us. The courts should be involved in dealing with incidents of pollution, trying to create a situation where the government takes the lead, the public is involved and the rule of law provides safeguards. Gui: What do you see as the role of the Supreme Court’s new tribunal? Luo: The tribunal will mainly provide summarisation, research and guidance, strengthening the rule of law. Actual cases will still be handled by the local courts. The state has called for an ecological civilisation, but overall environmental protection currently does not look good. So there’s a need for the judiciary to get involved in this work.